I hope this finds you happily on your yoga mats, perhaps resettling back into a familiar routine after an active summer outdoors, or maybe even developing a self practice for the first time. Autumn invites us inwards – indoors, into our inner selves, and into our physical bodies. And as you’ve probably worked out by now, the best way inward on multiple levels is via your yoga practice. We all have busy lives, but the best gift you can ever give yourself is that of wellness. Invest in your own health and wellness and it pays dividends – physically, mentally and emotionally – for yourself and those around you. Sometimes you can seamlessly work it into your schedule, and others you need to take time out to really get back to yourself and your practice – to go on a retreat or training in order to re-establish your practice or delve more deeply into it. Even if you don’t think you have time, make it. You can find a way. This is how we maintain balance and our connection with ourselves. This September, after completing an intensive Prana Kriya Yoga training, I sat 12 hours per day for 10 days in a Vipassana silent meditation retreat with my teacher, Yogi Ashokananda. That may sound a bit extreme to most people, but I guarantee it’s the best gift you can ever give yourself – spending 10 days intimately with yourself, confronting your own emotions and examining closely what goes on inside your mind. It’s so crucial for all of us to do regularly in this digital age. I highly recommend that you give it a try at some point. However, maybe this is not the best place to start. Ease into this habit of investing in yourself and your yoga practice with a less extreme retreat or training – one where you practice yoga daily and have your own time to relax, reflect, and revel in the moment with other guests (in silence or not, as you wish). I highly support this approach, and, in fact, am dedicating my life to facilitating that process for you. In the next few months I’ll be leading classes and retreats in Borneo, Malaysia and Tiruvannamalai, Tamil Nadu (South India). I would love to see you on the mat in one of my classes, but my hope for you is that you make it to the mat and stick with your practice wherever you are. The results speak for themselves. Just keep breathing. You can find further details below on my upcoming retreats. Love and light to you all for a fabulous Fall season, yoga family. Om shanti. Come for 2 days or 20. These bespoke retreats are designed to provide the flexibility to fit your travel and health and wellness needs in one all-inclusive package. Beyond yoga and meditation classes, other fitness classes and a gym are available; local tours and excursions can be included if you want to maximize your tour time, or massage if you want to tone it down. A soothing beachfront setting provides the perfect backdrop, complete with all the toys: paddleboards, kayaks, snorkels, and more. Add to that healthy, local food made with a smile, and luxury huts overlooking sunrise on the beach. In short, Yoga in Beach Paradise. Get the royal treatment at my only solo retreat this year, at a very special place that I can’t recommend highly enough. 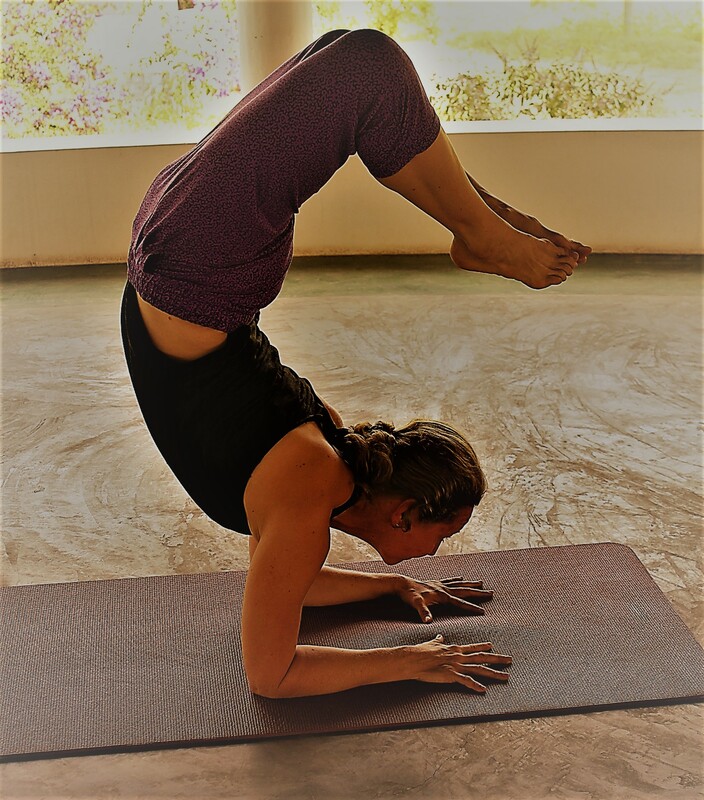 Set in a beautiful, peaceful rural space just outside one of the spiritual centers of South India, this is the ashram where I did my yoga training and that I would like to share with you. It’s got everything for the ideal yoga retreat (unless the beach was on your list, in which case, see above): a large, open-air shala; the best (local, organic) vegetarian food that you’ve ever tasted; a tranqul setting in nature with diverse flora and fauna; comfortable, spacious rooms with multiple options available; local excursions such as a powerful 9th-century Shiva temple; and a brand new swimming pool (who needs the beach?). This is the retreat for those more interested in the yoga than the local sites, who want to dive into their practice and their own journey. Yoga in Yogi Heaven. If you’re unsure, contact me with any questions.